A broken link is a link that directs visitors to a page or file that no longer exists. It is sometimes collectively referred to as link rot, or simply as dead links. The above reasons assume that a link has become broken because of a website owner changing a URL or removing the page. However, sometimes the fault lies with you, not them. It is easy to make a mistake and link to the wrong URL. A common error is to forget to include http:// at the start of a link. When you make this mistake, browsers assume that you are trying to link to a location that is relative to your current location. For example, if I incorrectly linked to www.google.com from this article instead of http://www.google.com, the URL would be publised as https://www.elegantthemes.com/blog/www.google.com. There are many benefits to fixing the links that are broken on your website. First and foremost, you will give your visitors a better user experience. I am sure you have been reading a good article and then discovered that the links that are contained within it are all outdated. It is very frustrating. This reflects badly on the website and suggests the content is outdated and no longer relevant. Secondly, there are SEO benefits to fixing broken links…isn’t there? Many SEO experts say that fixing broken links, missing images, and 404 page errors, will improve your overall search engine ranking. I have found that for every person out there backing this claim up with hard evidence, there are thousands of people who state with conviction that fixing broken links will give you an SEO boost, only because they heard someone else say this. I wouldn’t be surprised if I made this claim myself several years ago because I assumed it was true. I don’t know if it is true or not as I am not an expert on search engine optimization. Google states on their website that 404 errors will not impact a website’s ranking. This conflicts with the idea that 404 errors and broken links can hurt a website’s ranking. Even though Google has confirmed that 404 errors will not hurt a website’s rankings, they do encourage all website owners to fix links on their website. Google also has a long history of saying one thing, and doing another; so perhaps 404 errors can damage your ranking. For me, whether 404 errors and broken links hurt search engines is a non-issue, as it is in your interests to fix links that have been broken if you want give visitors a good experience. This is a big priority if the articles that have broken links generate a lot of traffic. Let us take a closer look at how you can find broken links on your website. Google Webmaster Tools is a great way of finding 404 errors and broken links. 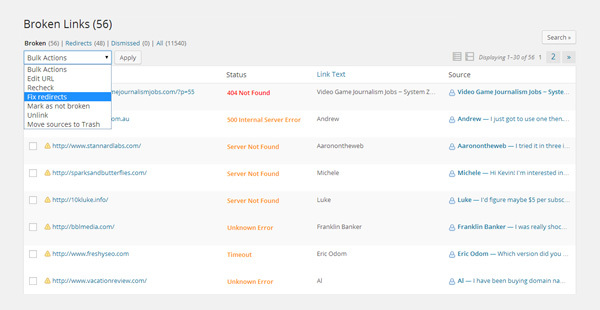 You will find this information in the Crawl Errors page; which is located in the Crawl section of the main menu. The page displays site errors and URL errors for desktops, smartphones, and feature phones. URL errors are categorized, with server errors, soft 404 errors, and normal 404 errors (not found), all being shown separately. The Crawl Errors page highlights errors on your website. The not found page lists all of your 404 errors. It is worthwhile going down the list and checking each error. Some errors will refer to pages that you have removed from your website, however others will be genuine broken links that need to be fixed. Google lists all of your broken links. Clicking on the error brings up details about the broken link, such as the full URL of the broken link and the first time the error was detected. 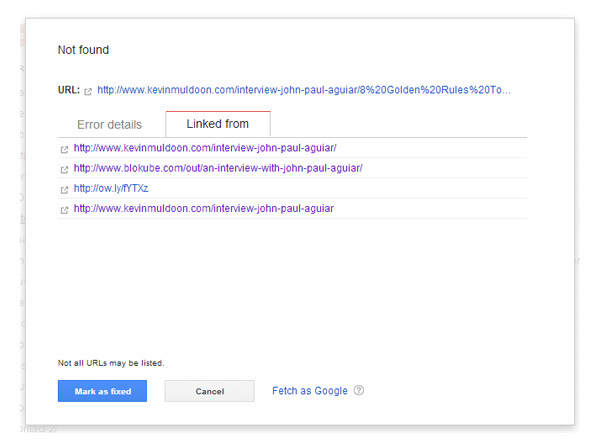 Google provides information about each broken link to help you resolve the issue. The “Linked From” tab will help you see exactly where the broken link was found. As you can see, I found a broken link on an interview I published in 2012. The “Linked From” tab shows you the page the broken link can be found. In the post, I should have linked to an article entitled “8 Golden Rules To Attract Twitter Traffic“. Unfortunately, I incorrectly linked to the page using <a href=”8 Golden Rules To Attract Twitter Traffic” title=”http://www.johnpaulaguiar.com/8-golden-rules-to-attract-twitter-traffic/”>8 Golden Rules To Attract Twitter Traffic</a>. As you can see, I placed the URL in the title attribute and the title in the href attribute. It is a simple mistake that can be made from time to time; but it was enough to break the link. Fixing the code will repair the broken link and stop it from being listed as a 404 page error on Google Webmaster Tools. 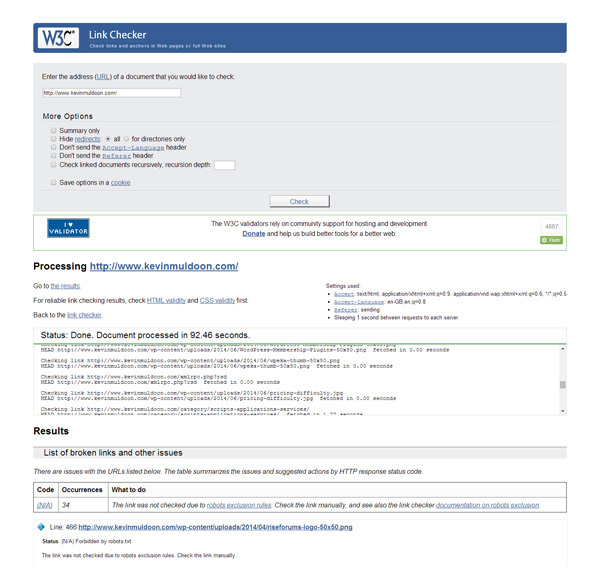 W3C, aka the World Wide Web Consortium, has a link checker that checks broken links and more. Since W3C is responsible for maintaining standards for the web, their link checker is recommended by many website owners. I am not a big fan of the way the link checker works. It is more of a pain to detect broken links and resolve the errors than other solutions available. However, there is not denying the link checker is thorough and lists all the broken links found on your website. W3C Link Checker will highlight broken links, redirects, valid anchors, and more. Broken Link Checker is one of the best link checking solutions available to WordPress users. The plugin scans your whole database and displays the links that are broken; highlighting the http status code, the link text, and the post or page in which the link can be found. You can select broken links and choose to mark them as not broken, unlink the link, and rescan. Broken Link Checker scanes all of your posts and pages. The great thing about the plugin is that it can scan your database regularly and then email you if it finds a broken link. It can also apply formatting to broken links so that they are easily visible to everyone. You can choose what custom post types are scanned for links and whether posts with different statuses, such as draft or scheduled, are also scanned. The plugin can also scan for YouTube, Vimeo, DailyMotion, Google Video, and Megavideo videos, and then report to you if the video has been removed. Broken Link Checker will email you if it finds a new broken link. Xenu’s Link Sleuth is a script available for Windows that can check links, images, stylesheets, and scripts. Once it has scanned your website, it will provide information such as the URL, page size, page title, last date it was updated, outgoing links, and incoming links. It can also detect redirected URLs. The report that it provides can be exported as a CSV file and emailed easily due to its small size. 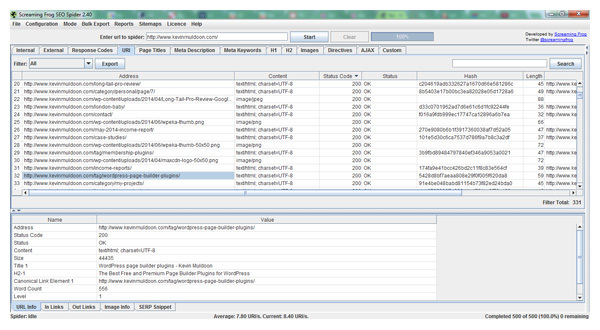 A Google sitemap can also be created through the software. 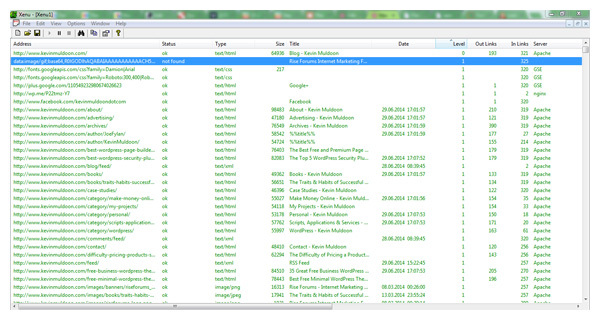 Xenu’s Link Sleuth is a useful script for Windows users that allows you to export the report. Screaming Frog SEO which can crawl your website and provide a detailed report on broken links, errors, missing header tags, meta information, and more. It can also be used to create an XML sitemap for your website. The software is available for Mac, Windows, and Linux. The free version of the script has a crawl limit of 500 URLs. The premium version removes this at a cost of $99 per year. If you are using the software for all of its SEO features, you should consider the premium version. However, there are many free broken link solutions available that don’t have a restriction of 500 URLs. Screaming Frog SEO is a feature packed SEO script that can check for broken links. PowerMapper’s SortSite can help you find broken links and missing images. It can also be used to find errors with CSS, flash, RSS, scripts, and more. PowerMapper’s link checking solution is available online or as a script that works on Mac, Windows, and tablets. They offer a free evaluation, but with only 10 pages and images provided in the report, it is way to limited to be considered a free solution. They do, however, allow you to test their service for 30 days. Their SortSite Desktop retails from $149, with their Mac and Tablet ready OnDemand Suite costing $49 per month. Link Valet is a basic link checking service that highlights the HTTP response codes of links on your website. It can take a while to scan your whole website, and while the color coding does help you spot broken links, there is not an easy way to see all broken links together at a glance. Link Valet displays a unique color for each type of response code. Link Checker is a website validator script that is available FREE under GPL for Windows, Mac, and Linux. It can crawl your website for broken links and provide a report that can be exported in normal text, HTML, SQL, CSV or XML. The software will also honor the rules you outline in your robots.txt file. Link Checker is a great script that was released under the General Public License. Below is a list of other resources that you may want to use to find broken links on your website. They are all free to use. iWebTool Broken Link Checker – A basic link checker that scans your website links. Check My Links – A Google Chrome extension that scans a page for broken links. Online Broken Link Checker – A simple website scanner that will highlight broken links on your website. Permalink Finder Plugin – A WordPress plugin that fixes any problems you have with your permalink structure. Once you have created a list of broken links on your website, you can proceed to repair them. There are a few ways in which you can do this. Correct the Link – If you linked to a website incorrectly, all you need to do is edit the URL and replace it with the correct value. For example, one of the most common reasons a link becomes broken is because the author forgot to put http:// at the beginning. Sometimes, correcting a link requires more investigation, such as when a page you linked to has been moved to a new location or the website has completely changed their domain. Replace the Link – There are times when it makes more sense to replace a link in an article. For example, when you have referenced a resource that no longer exists, is no longer supported, or has not been updated in years. The idea is to replace the website you referenced with an alternative resource. This ensures that the article remains useful to visitors. Unlink the Link – If the page you linked to no longer exists, or is no longer relevant, you may want to completely remove the link from the article. This may also mean removing any content that refers to the page you referenced. Restructuring your website, or changing the post or page slug, can cause 404 errors on your website (not found errors). This will make your internal links to the old URL invalid. It can also reduce the traffic your website receives from other websites, therefore it is important to address the issue. The most practical way of resolving the issue is to create a 301 redirect from the old URL to the new one. This ensures that traffic, and search engine juice, is transferred to the new URL. If you have found that another website has simply linked to one of your pages using an incorrect URL, you may want to consider contacting them and advising them of their mistake. Do not be concerned if the website owner does not comply with your request, as you can always configure a redirect to handle incoming traffic to the incorrect URL. Additionally, if you have set up a good 404 error page on your website with a search bar and links to your archives, visitors should still find the page in question. If you have not performed a clean up of your broken links in sometime, you may have to spend a few hours fixing issues on your website. However, after you have done so, the task of keeping the links on your website clean becomes simpler, as you only need to review your website links periodically. A solution such as the WordPress plugin Broken Link Checker makes this process straight forward as you will be emailed whenever a broken link is found. Whether fixing broken links helps search engine rankings or not is irrelevant, as repairing broken links on your website will ensure your articles remain useful to your readers. That alone makes it worthwhile. There are many ways to find broken links on your website. 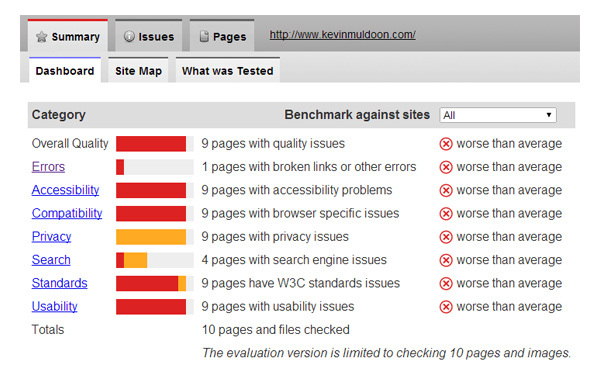 My own preference is Google Webmaster Tools or the WordPress plugin Broken Link Checker. However, some of the other solutions mentioned in this article offer a more complete picture of the problems associated with your website, such as missing header tags and problematic usability issues. I hope you found this article on fixing broken links useful. If you know of any other great ways to find broken links on a website, please feel free to share them in the comment area below. I was only aware about the WordPress plugin. All other sources are new for me. Thanks for drawing my attention to other sources. Kevin, great article, thanks for including me. Great coverage of all the tools to check links…Screaming Frog is my go-to tool. I use Broken Link Checker and it’s a lifesaver. It comes up pretty often with links that aren’t actually broken, but i’d rather be safe than sorry. Especially since I’ve had posts with over 30 links. I personally use Google Webmaster Tools and W3C. Using an internal plugin to check for broken links sounds like a great idea, will try it if and when I encounter broken link issues again. I use Broken Link Checker. I leave it deactivated for the most part (for the slight speed increase of the site) but I’ll activate it and let it crawl the site every few days. I’m now interested in Xenu’s Link Sleuth since it doesn’t appear to need to be loaded on the site and I can create a sitemap. Also, I usually linked to ex: http://www.google.com with no http(s)://. I still don’t receive any link errors and they all open fine. What gives? I’ve been using Broken Link Checker since I started using WordPress over 20 months ago. Very reliable. I run it on three sites. I have it notify me via email if there are broken links. I’m happy and will stick with it. It does make it easy to fix the link, or remove it, etc. I’ve used Xenu’s Link Sleuth when I ran various HTML sites. Probably have 10 or more years of using it. Also reliable (although I haven’t looked at it in literally MONTHS almost years). I do remember that I had to activate it myself. I use often Xenu, Google Webmaster Tools and Broken Link Checker. I will try other tools soon. In conjunction with these tools I use Redirect plugin to avoid 404’s for non-existent articles. Have used Broken Link Checker and Xenu for many years. I’m planing to move a forum from phpBB to bbPress. The forum conversion tool embed on bbPress does not convert internal links inside forum posts (for example if somebody refer to a link in another topic), so I will have a lot of broken links. So for posts which point to something like viewtopic.php?f=39&t=7320 the link of new topic on bbPress will end with “/7320” on its post URL. Have someone do it before? The image for the post is epic! Thanks for the useful list, and I would like to recommend Integrity for Mac, which is free and works great for me. i am a big user of google webmaster tools for my websites, it’s working nicely once it’s well configured. There is pretty much everything we want there as a webmaster. Very informative article with many choice of tools to find broken links. Personally I use google webmaster tool, but maybe I’ll also try the other tools. Very thorough and informative article Kevin … thanks. I’ve been using Broken Link Checker but it’s interesting to learn about the other options. Very nice artice. Informative. I really like to use other tools too. 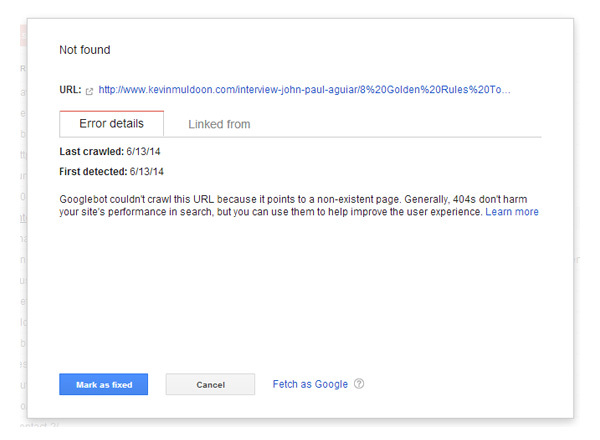 Currently i am using Google Webmaster tool for broken link checks. I’m going to check it on other tools which you have mentioned over here. Thanks for sharing such a good tools. thanx for providing such useful post for bloggers. It will help newbie like me to understand broken links…. Very useful post on detecting and fixing the broken links. Thanks for sharing it. It will definitely be useful for all bloggers. 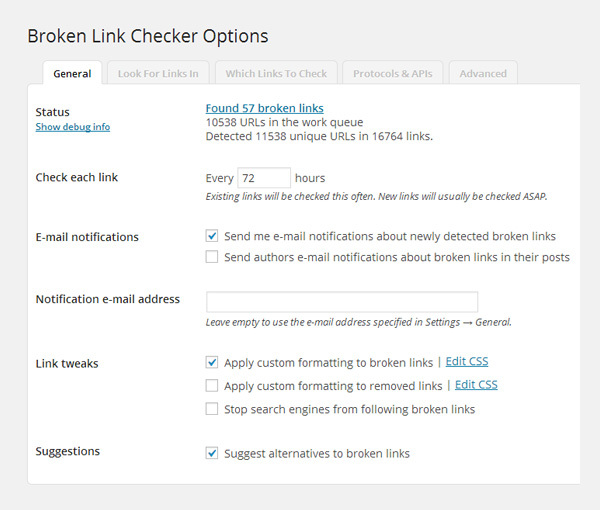 I pick Broken Link Checker, and for those using wordpress, I recommend to use this plugin, because it is easy use.. I use Broken Link Checker. Some of the URLs it identifies as broken (like this: http://ideacrib.net/wp-content/plugins/commentluv/images/[email protected]) seem to be just fine though. Overall, it seems to be one of the better broken link plugins out there. I know a few other people who use and recommend it. I had forum for my website http://www.askeygeek.com/discussion/* but I had to delete that forum after few months as I was not able manage it properly. Now the problem is after deleting that forum when I check Google Webmaster Tools Crawl Errors it shows 15,896 Not Found 404 pages. I installed Broken Link Checker plugin in my wordpress but that doesn’t show these links and I don’t know to fix. Could you please help me solve this?? Yeah its a crucial part of every blog to remove broken links for that I was using some kind of plugin(I don’t remember the name) and it works fine. I might sound foolish, but does the Broken Link Checker Plugin basically do the same as Webmaster Tools when it come to checking any faulty links? I am using Google Websmaster to check broken links, however is there a faster way to fix internal links in each post other than manually opening the content editor and relinking? I have over 350 broken links from changing my perma link structure and domain name. This seems to be very time consuming! This post has given me good information about the broken link importance in SEO, till now I only know about the broken link checker WordPress plugin, after reading this post I came to know about another plugin which are available to fix the broken links on our blog. Thanks for sharing such an informative topic, see you soon with another article. Check my links – that chrome extension works pretty well for me. The broken links detection is the common problem in WordPress blogs and Blogspot blogs. But if we not consider as serious issue, may be this issue affects on Blog ranking strategies. So the removing of Broken links are very important. The list given above helps to identify the broken links in blogs database. The tools are simplifies this issue very easily. My favorite broken link checkers are Broken link checker WordPress plugin and Siteliner. i am working with these plugins in my blog. Since Google is looking so closely at user experience as part of its rankings, I can not imagine that 404’s would not be considered a negative for a website. Recently I started my website & while keeping eye on SEO related thing I came across same thing. Realy thanks for your post. By luck I came across this article. Very useful. Thanks for this informative post. Thank you so much I am looking for this information since quite long time. Thanks again. broken link detection and fixation is play vital role. It’s been long time I was searching this information. Its quite helpful to me. Broken Link checker is the best solution for this problem. If your site has broken links, search engine decrease your site rank.